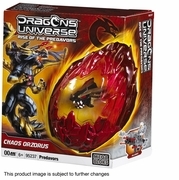 Product Detail Summary: From the Orzerath species, Chaos Orzorus is a large Master-class Dragon that moulds the forces of dark energy and space to obliterate enemies. He has bonded with his Dragon Rider, Orosius, to increase his strength and abilities! Members of the Predavor faction, they are fighting for complete control of all the Power Cores in the universe.